Solar Photovoltaic (PV) panels are generally fitted on the roof in a northerly direction and at an angle to maximize the amount of sunlight that hits the panels. Solar PV panels on the roofs of homes and businesses generate clean electricity by converting the energy in sunlight. This conversion takes place within modules of specially fabricated materials that make up the solar panels. It is a relatively simple process that requires no moving parts. In most cases, solar panels are connected to the mains power supply through a device called an inverter. The technology to convert sunlight into electricity was developed in the 19th century. The price of solar systems has dropped dramatically over the past few years, making it an increasingly attractive option for homes and businesses. Your energy consumption and the size of your solar power system – if you use more power than your system is capable of producing, your savings will be reduced. This can be avoided by choosing the right-sized system for your needs. Your feed-in tariff– this is the amount your electricity retailer pays you for any excess power your solar panels generate. Your usage patterns – solar panels can only generate electricity while the sun is shining. This means that households that use a lot of power during the day may attract greater savings than those that consume most of their power at night. However, you will still receive a feed-in tariff for any excess electricity you generate during the day. Where you live– some areas of Australia receive a lot more sunlight than others, so a solar PV system in Brisbane will usually generate more power than one in Hobart. How much power does a solar panel generate? A typical Australian house consumes around 18-kilowatt hours (kWh) per day so a 1-2kW system displaces an average of 25-40% of your average electricity bill. Solar panels produce more energy in summer than they do in winter. What size solar system should I install? What portion of your electrical consumption you wish to generate. To work out what size solar PV system you require, you need to analyze your household’s daily electricity consumption. Your monthly or quarterly electricity bill measures your household’s electricity consumption in kilowatt hours. 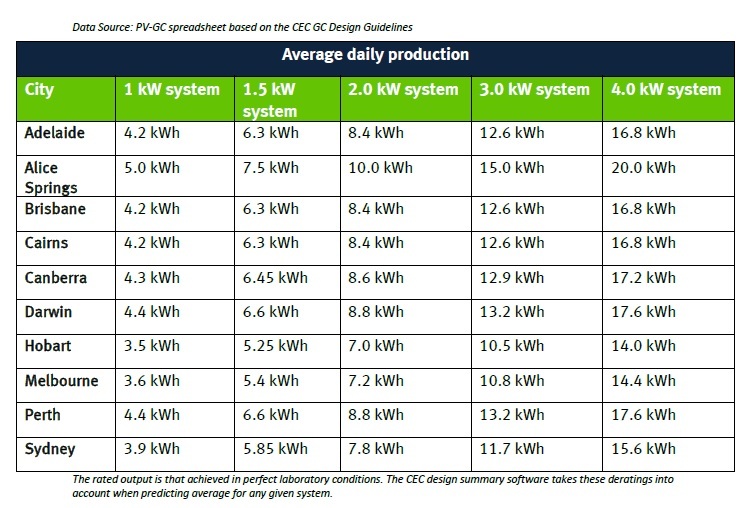 From this figure, you can calculate your average daily electricity consumption, and the average amount of electricity your solar PV system needs to produce to cover your electricity needs. SOLARMATIC is a trustworthy Australian company. We have successfully completed plentiful solar projects. Our motto is to retain the consumer’s trust by serving them the best. We focus on solar battery storage solutions, repair, safeguarding and fixing of PV solar systems. These terms and conditions outline the rules and regulations for the use of Solarmatic Pty Ltd Website. pages from https://solarmatic.com.au for your own personal use subject to restrictions set in these terms and conditions. Redistribute content from Solarmatic Pty Ltd (unless the content is specifically made for redistribution). Like most website operators, Solarmatic Pty Ltd collects non-personally-identifying information of the sort that web browsers and servers typically make available, such as the browser type, language preference, referring site, and the date and time of each visitor request. Solarmatic Pty Ltd purpose in collecting non-personally identifying information is to better understand how Solarmatic Pty Ltd visitors use its website. From time to time, Solarmatic Pty Ltd may release non-personally-identifying information in the aggregate, e.g., by publishing a report on trends in the usage of its website. Solarmatic Pty Ltd also collects potentially personally-identifying information like Internet Protocol (IP) addresses for logged in users and for users leaving comments on https://solarmatic.com.au blog posts. Solarmatic Pty Ltd only discloses logged in user and commenter IP addresses under the same circumstances that it uses and discloses personally-identifying information as described below. Certain visitors to Solarmatic Pty Ltd websites choose to interact with Solarmatic Pty Ltd in ways that require Solarmatic Pty Ltd to gather personally-identifying information. The amount and type of information that Solarmatic Pty Ltd gathers depend on the nature of the interaction. For example, we ask visitors who sign up for a blog at https://solarmatic.com.au to provide a username and email address. Solarmatic Pty Ltd discloses potentially personally-identifying and personally-identifying information only to those of its employees, contractors and affiliated organizations that (i) need to know that information in order to process it on Solarmatic Pty Ltd behalf or to provide services available at Solarmatic Pty Ltd website, and (ii) that have agreed not to disclose it to others. Some of those employees, contractors and affiliated organizations may be located outside of your home country; by using Solarmatic Pty Ltd website, you consent to the transfer of such information to them. Solarmatic Pty Ltd will not rent or sell potentially personally-identifying and personally-identifying information to anyone. Other than to its employees, contractors and affiliated organizations, as described above, Solarmatic Pty Ltd discloses potentially personally-identifying and personally-identifying information only in response to a subpoena, court order or other governmental request, or when Solarmatic Pty Ltd believes in good faith that disclosure is reasonably necessary to protect the property or rights of Solarmatic Pty Ltd, third parties or the public at large. If you are a registered user of https://solarmatic.com.au and have supplied your email address, Solarmatic Pty Ltd may occasionally send you an email to tell you about new features, solicit your feedback, or just keep you up to date with what’s going on with Solarmatic Pty Ltd and our products. We primarily use our blog to communicate this type of information, so we expect to keep this type of email to a minimum. If you send us a request (for example via a support email or via one of our feedback mechanisms), we reserve the right to publish it in order to help us clarify or respond to your request or to help us support other users. Solarmatic Pty Ltd takes all measures reasonably necessary to protect against the unauthorized access, use, alteration or destruction of potentially personally-identifying and personally-identifying information. Solarmatic Pty Ltd may collect statistics about the behavior of visitors to its website. Solarmatic Pty Ltd may display this information publicly or provide it to others. However, Solarmatic Pty Ltd does not disclose your personally-identifying information. To enrich and perfect your online experience, Solarmatic Pty Ltd uses “Cookies”, similar technologies and services provided by others to display personalized content, appropriate advertising and store your preferences on your computer.